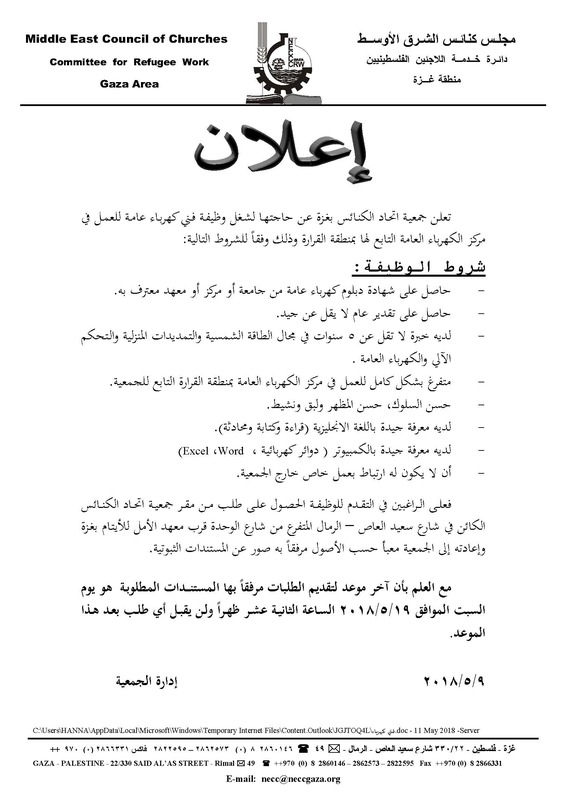 NECC - Gaza is hiring an Electricity technician as in the following ad ..
NECC - Gaza is hiring an Electricity technician as in the following advertisemen ..
”Gaza is on the verge of collapse. There is almost no opening for new jobs”, many youth applicants said. As the situations in Gaza Strip conti .. Opening Ceremony of the official st .. The opening ceremony that was held at the Near East Council of Churches (NECC) headquarter premises was devoted to the opening of the vocational training centres funded and supported by EU in its .. Vocational Education and Training p ..
One of Near East Council of Churches’ (NECC) main program is the Vocational Training and Education; which seeks to eliminate the suffering o ..
Near East Council of Churches Committee for Refugee work (NECCCRW) core stone is the health program; as NECCCRW believes that good health is essential to human welf ..
Psychosocial Interventions common t ..
One of Near East Council of Churches’ core activities is the Psycho social Program which seeks to help children develop into health ..
My name is Rehab, a 30 years old, my husband is un-employed and we have five children and we depend on others assistance. My youngest child is 3 months years old; I follow up my children’s ..
Najwa is a pregnant lady who follows up her pregnancy at Al Daraj Health Clinic. Najwa lives with her husband and children in a very small house consists of two bedrooms, one bathroom and one sm .. This story is for a student who was born in 1994 and holds a sixth-grade primary school certificate, he did not have a desire to continue his education, he said “I wish I can learn the professio ..
APF Forum Annual Meeting and Field ..
UN women, ACT strategic plan 2015-18, emergency response appeal and capacity building held APF forum annual meeting in Gaza at New Roots Hotel from 28-30 September 2014 discussing important topi ..
Mr. Colin D Johnston, and Mr. Georg ..
Mr. Colin D Johnston” Minister of St Andrew’s Galilee, Tiberias”, and Mr. George Shand “Minister of St Andrew’s Church Jerusalem”. 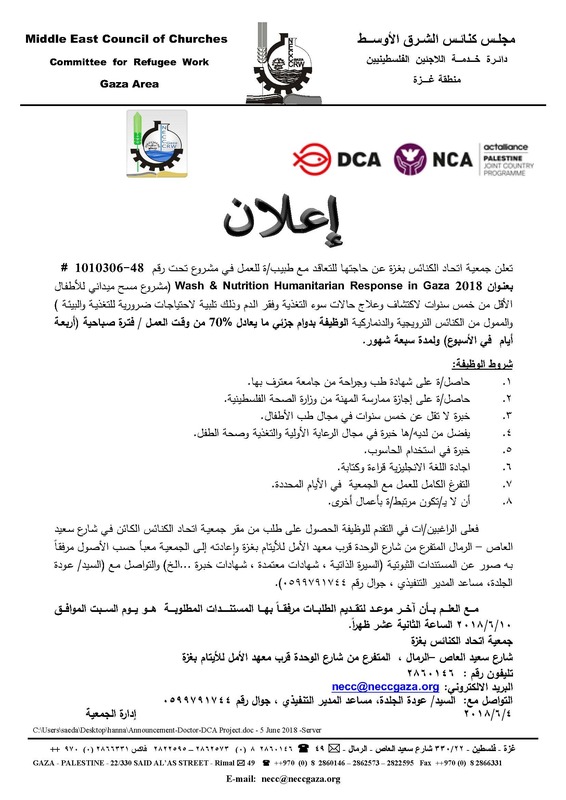 Mr. Issam Farah , NECC Executive Director Assistant , ..